As part of the deal struck between the companies earlier this year,Starbucks is now accepting Square's mobile application at almost 7000 stores around the nation. 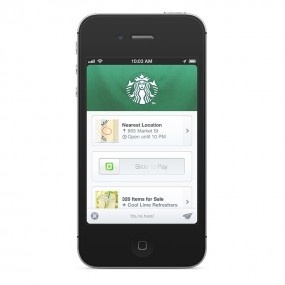 Starbucks customers are already quite familiar with app payments, having been able to use Starbuck's own app for the better part of two years on their iPhones or Android devices. There are some glaring differences between both services, however. The Starbucks app requires you to have a Starbucks card, with pre-loaded money on there, whether done online or with an actual card. Square's service allows you to pay with a linked debit card or card. The Square Wallet can also obviously be used at places other than Starbucks. Square is available for free on Android and iOS devices.